When are you attending ST Octane Academy? Thread: When are you attending ST Octane Academy? Bought the FIST on valentine day......and the academy is already fully booked according to their website. I had to wait a year. I bought my car in July and went a year later in August. Even though it says within a year, they said it wouldn't be a problem. So glad I went. Wife had fun also. Keep in contact with them, people back out and spots open up. You might have short notice but it's worth it. If you can't this year, then still get in contact with them so you can attend early next year even though you'll be past the 1 year mark. Thanks for the info...will call them tomorrow. I went last Monday-Tuesday. A first rate experience. Really get to stretch out both the Fiesta ST and The Focus ST. Instructors were helpful, was very well organized. The facility is first rate as well. If you have the opportunity, do not miss this. Track was recently purchased by Geely from China, so the future is somewhat uncertain. 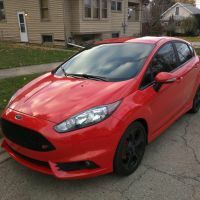 That and the ending of production of the Fiesta ST and Focus ST for north America brings uncertainly. So to sum it up...GO, if you can! I am headed for the June 6-7 session. My 2019 special order has yet to be delivered (scheduled for May 9), but my VIN allowed me to get signed up. Anyone else here scheduled for those dates? ST Octane Academy is for Canadians too! Octane Academy is a must!! anybody on here doing octane academy oct 12/13?